The Italian crowds reaction to the triumphant return of the reigning Olympic all-around Champion, Gabby Douglas and the reigning Olympic floor champion, Aly Raisman. Which gymnasts made a case for themselves not to be ignored at Jesolo: Erika Fasana, Alysssa Bauman, and Laurie “Baby Sharkira” Hernandez. How to tell how Marta feels; The Marta’s head-squash vs. the scruff of the neck kitten-grab. Was the mood between Gabby and Chow strained? The XL Center Bat, The Antwerp Moth, The Nanning Bee and now, The Jesolo Dog. Jesolo Judges: Why were the judges 100 miles away from the apparatus and did it effect the scores? Plus, how the judges broke protocol; they just couldn’t’ help themselves. Why Carlotta Ferlito quit Mtv Italy’s Ginnaste – Vite Parallele reality show. Flame cannons; juniors beating seniors; special awards; and Amy Tinkler, the smiliest winner of all time. Ellie Downie’s successful but strange competition, walking off of the beam rather than dismounting. Kelly Sim did a full-in dismount off of beam! Why we love British Disability Champion, Tasha Coates who is allergic to exercise. 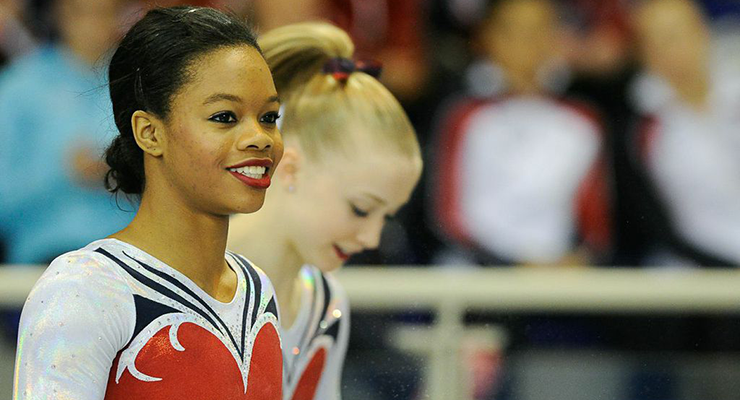 Douglas Family Gold: Oxygen is working on a series about Gabby Douglas and her family. Can it be done tastefully or will it make her out to be a train wreck? SB101: Indiana has legalized discrimination against LGBT citizens. How this would impact gymnastics and why we are cheering on Steve Penny, Josh Dixon and Danell Leyva in their fight against Indiana’s Governor Pence. The world rankings from The All Around here. Beyond The Routine: WOGA watch here. Find out what it’s like to be allergic to exercise. An essay by British Disability Champion, Tasha Coates here. USA Gymnastics has a photo gallery from training through finals of Jesolo here. Ellie Downie didn\’t walk off the beam…she fell but hit her set, and did a Patterson dismount. Becky walked off the beam. Meant to say Ellie only fell on FLOOR, not beam! Her beam had some wobbles but she hit it and did the Patterson. I just wanted to comment on the mumps discussion. Your parents don\’t have to be crazy anti-vaxers in order to get it. The mumps vaccine is actually the least effective vaccine in the MMR shot. It is only 80% effective, so even people who have been properly vaccinated can get it. I learned this when I became sick with an illness that several doctors believed was mumps. When I was told this I was floored, because I had been vaccinated both as a child and as an adult. I turned out to have something even more uncommon (but not very serious), but from what I understand mumps is like a really bad flu combined with the painful swelling of your saliva glands. Some people can develop complications that cause other organs to swell, or the saliva glands can swell so much that they disrupt the bones in the ear and cause deafness, which is why we now vaccinate against it. But most cases resolve on their own with rest in 2 weeks or so. But this is a small point. Keep up the great work! Thanks for that explanation, Jasmine! Thanks so much for this info! We were hoping one of our knowledgeable listeners would have the answer. I am fairly confused about this British person you sometimes have on this program. I really enjoy this podcast because it has insight, so it is great to listen to Mary Anne from Australia because she is a gymnast and knows of which she speaks. I do not think the British woman knows anything aside from stalking the gymnasts! I suppose that is fine, and I do not judge her, but I do not understand why she is on a program speaking with experts. Are you guys doing another Gym Castic Meet up at NCAAs this year? Not planning on it but if there is a listener who wants to plan it, we will promote it! Noted! We always try to think of the Wizard of Oz but sometimes the Ausssstralia comes through instead.